I’ve been working on new ways to subdivide poolyhedra to make higher frequency dome structures, the problem with conventional subdivision is that as you go up in frequency the complexity goes up exponentially, 6 different panels for a 4v rather than just 2 for a 3v dome for example. I discovered this new method in a coffee shop in Penrith playing on my laptop, I thought about calling it coffee shop subdivision but settled on regular subdivision instead. 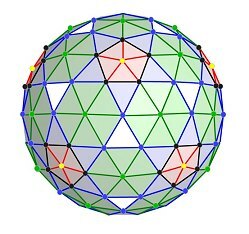 Classic subdivision projects vertices out so if you subdivide an icosahedron x number of times by the time you project out there is a lot of distortion because each vertex moves out toward the sphere a different distance. This is why you end up with lots of different chord lengths and why it gets worse as you increase frequency. 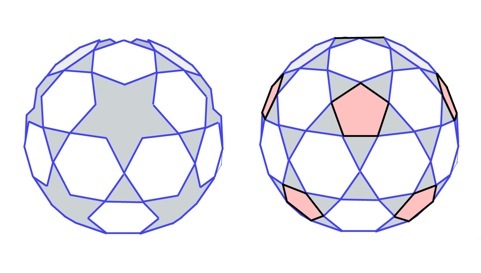 So instead of using points projected out I thought about using regular polygons to break down a polyhedron into smaller more regular shapes without any distortion. 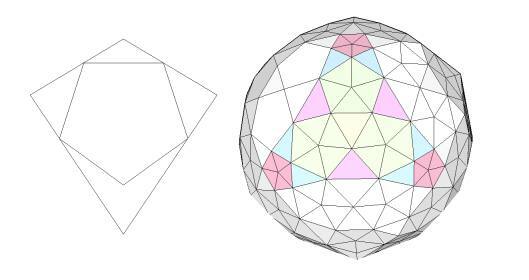 Start with any convex polyhedron, solids with all faces the same are the best place to start, we know if we can successfully subdivide one face all the other faces will repeat across the whole polyhedron. Next we need a regular polygon to draw on the face of our parent polyhedron, we can use a triangle, square, diamond, pentagon, hexagon or a number of others but the idea is that we cover as much of the face as possible with a regular polygon or collection of polygons, it sounds complex but it is quite easy to illustrate with a couple of diagrams, let’s use the Rhombic Triacontahedron as the parent and subdivide it with a regular hexagon. 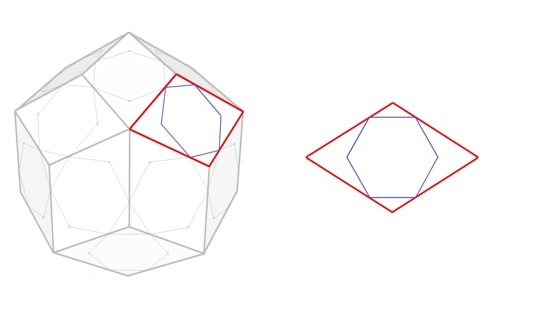 From the diagram above you can see that we’ve taken a single face from a Rhombic Triacontahedron and drawn a regular hexagon on its face so that the vertices of the hexagon intersect with the edges of the triacontahedron, this is repeated on all the rhombic faces before removing all the edges of the parent triacontahedron, we’re left with a collection of regular hexagons arranged in a sphere. I'll be adding lots more over the next few weeks so keep an eye on the design portfolio.